“We have seen the true light, we have received the Heavenly Spirit, we have found the true faith, and we worship the indivisible Trinity; for the Trinity has saved us.” (Pentecost Vespers, STICH ERA, Tone 2) This ” true faith” inspired 8t. Gregory of Nazianz to deliver his sermon about the divinity of the Holy Spirit, Who ” completed the work of Christ.” Gregory’s sermon was addressed against the followers of his predecessor in the See of Constantinople, Archbishop Macedonius, (d. 362) who denied the divinity of the Third Person of the Most Holy Trinity. 2 In the Old Testament, the Jews were ordered by God to celebrate the “Feast of Harvest” on the fiftieth day after the Passover (Ex. 23:16) in thanksgiving for the harvest, and were expected to make an “offering of the new fruits” of their crops. Hence they referred to this feast also as the “Feast of First Fruits” (Num. 28:26). Since, officially, the harvest lasted for seven weeks, the day was also called the “Feast of the Weeks” (Deut. 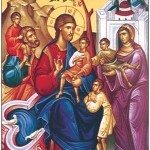 16:9-10). In post-exilic times, the Rabbis had a custom of motivating their liturgical celebrations with certain events of their sacred history. Thus they tied the Passover with the miraculous liberation of their people from the Egyptian captivity, and the Feast of the Harvest with the Covenant of Mt. Sinai. According to the records of the Jews, the Mount Sinai events took place on the fiftieth day after the crossing of the Red Sea. Since the Feast of Harvest was celebrated on the fiftieth day after the Jewish Passover, the Greek speaking Jews (Tab. 2:1; II Macc. 2:31-32) simply referred to it as “Pentecost” (Gr. pentekoste-fiftieth, meaning: hemeraday). Thus, at the time of Jesus, the Feast was generally known as the “Feast of Pentecost” and was celebrated in commemoration of the Covenant with great pomp and solemnity. 3 Before His ascension, Jesus Christ instructed His Apostles to stay in Jerusalem and to wait for the ” promise of His Father,” which was to be fulfilled in a few days (Acts 1 :4-5). After the Ascension, they returned from Mt. Olivet to the Upper Room where they spent their time in “continuous prayer” (Acts 1 :14) and worship ” in the temple” (Lk 24:53). This was the first retreat of prayer and meditation made by the Apostles, the Blessed Virgin Mary, and the close followers of Christ. We can imagine the Apostles at that allnight vigil. They listened to these prophetic words with avid expectation. Down deep in their hearts they must have sensed their imminent fulfillment, and this did happen on the very next morning. The descent of the Holy Spirit took place on the Jewish Pentecost (Acts 2:1), which coincided with the fiftieth day after the glorious resurrection of Christ. 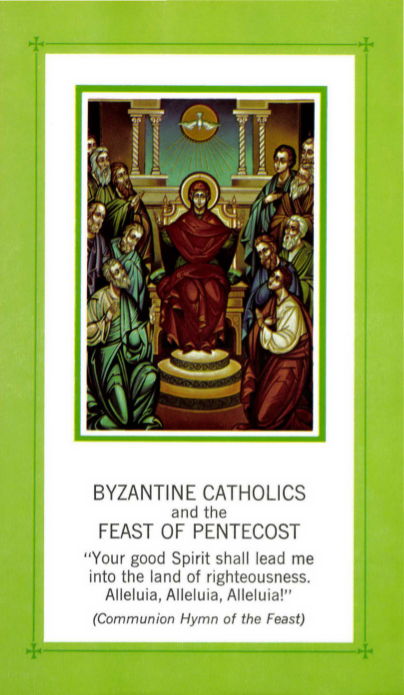 Therefore, the Apostles also refe rred to this memorable event as Pentecost. (I Co. 16:8) But the celebration of this event as a separate feast came somewhat later, in the second half of the fourth century. St. Gregory of Nyssa (d. 394), in his homily “On Pentecost,” already referred to it as the ” Great Festivity of Pentecost.” For the Christians it marked the completion of the redemptive work of Christ and the inauguration of the New Covenant, the Covenant of Grace which was poured down by the Holy Spirit. St. Peter did not hesitate to confirm this truth when describing the baptism of Cornelius’ house: “The Holy Spirit came down on them in the same way as it came down on us (the Apostles) at the ” beginning,” i.e. at the first Pentecost (Acts 11 :15). Similarly, S1- Cyril of Jerusalem (d. 387) explained to his neophytes: ” While our body is anointed with the visible ointment (chrism), our soul becomes sanctified by the Holy and Life-giving Spirit” (Catechesis 21, 3). The Holy Spirit gives us a new divine life and, therefore, we profess Him to be the “Giver of Life” (Cf. Symbol of Faith). The divine life is the life of grace, making us “partakers of the divine nature” (II Peter 1 :4) and true children of God: “The spirit you receive is not the spirit of slaves-but the spirit of children, and it makes us cry out, ‘Abba, Father!’ The Spirit Himself gives testimony to our own spirit that we are children of God!” (Rom. 8:15-16) Chrismation (Confirmation), then, is our own “Pentecost” when Jesus Christ pours upon us the fullness of the gifts of the Holy Spirit, enabling us to ” live a life worthy of our Christian calling” (Eph. 4: 10) as the children of God. 5 Since Pentecost was originally a feast of harvest, as was mentioned above, the Jews used to decorate their homes with the fruits of the harvest-flowers, green foliage, garlands etc.-in order to add more pomp and solemnity to their celebrations. This same custom was also adopted by the Christians. To them, however, the green branches and flowers took on a symbolical meaning-the divine life and gifts of the Holy Spirit. The festive decorations of flo w e r sand roses, it seems, was first introduced in Italy in the middle of the fourth century from where it spread to the East. Because of the decorations, the Pentecost festivities were referred to as “Festa Rosalia” (Feast of Roses). When the Byzantines accepted the custom , they also accepted the name with it and simply transcribed it into the Greek-“Rousalia.” Similarly, the Slavs in receiving Christianity accepted the custom and called the feast in their language-“Rusalya.” St. John Chrysostom (d . 407) admonished the faithful of his time not to celebrate the feast superficially, only adorning their homes with garlands (flowers), but rather spiritually adorning their souls with virtues in order to be more able to receive abundant fruits of the Holy Spirit (II Homily on Pentecost). Another popular name for Pentecost used by our people is “Zelenyi Svjata” (Green Holydays). This stems from the custom of adorning the churches and homes with green foliage (preferably linden branches) and grass in celebration of the feast. The green color of the foliage was accepted by our people as a symbol of divine life brought to us by the Holy Spirit. For this reason also, the clergy wear green vestments for the liturgical services on Pentecost and its postfestive period. Heavenly King, Comforter, the Spirit of truth, You are everywhere present and fill all things, Treasury of blessings and Giver of life, come and dwell within us, cleanse us of all stain, and save our souls, 0 gracious Lord. Blessed are You, 0 Christ our God, Who have filled the fishermen with wisdom by sending down upon them the Holy Spirit, and through them caught the universe in Your net. 0 Lover of men, glory be to You. When the Most High descended, He confused the tongues and scattered the peoples; but when He distributed the tongues of fire, He called all of them to unity. Therefore, we praise the Most Holy Spirit with one voice.